Our surreal meeting with a MASTER........too good to be true! 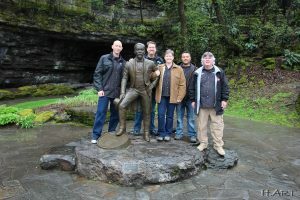 The Las Vegas Lodge 1, Jack Daniel’s Single Barrel Selection Committee, took just enough time out of our busy schedules to make a quick 37 hour trip to Lynchburg for an UNFORGETTABLE, once in a lifetime experience. 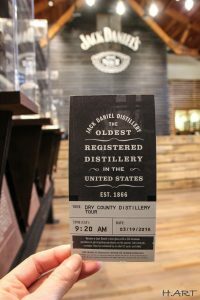 The Jack Daniel’s Distillery rolled out the red carpet for us, to say the least. 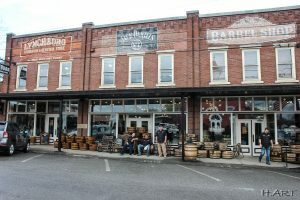 We were picked up by a stretch suburban from our fancy hotel in Nashville and driven like rock stars to the “back in time”, quaint little town of Lynchburg, Tennessee. When we arrived we were given a guided tour of the whole operation with stops at every step of the process. 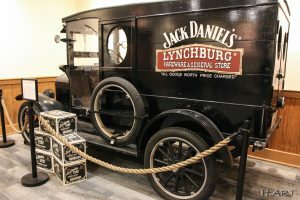 The folks at Jack Daniel’s have been bottling whiskey since 1866 and it was apparent they take it very seriously. The process starts with limestone spring water that comes straight out of a mountain stream two miles deep. 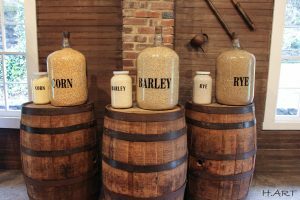 Jack Daniel’s mash is the perfect mix of corn, rye, and barley called the sour mash. This mash ferments for a full six days before being single distilled in a special large copper still. 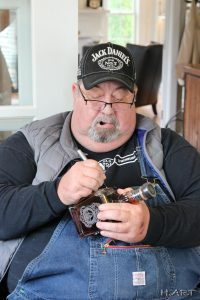 Once this mixture is distilled to 140 proof it is sent to the mellowing house to be dropped, one drop at a time, into ten feet of hard sugar maple charcoal that has been carefully crafted into quarter inch pieces. 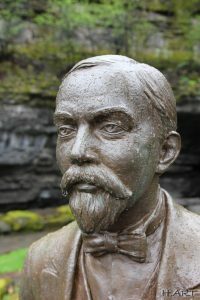 This process gives it the distinct smoothness known to all of the Jack Daniel’s brand whiskeys. 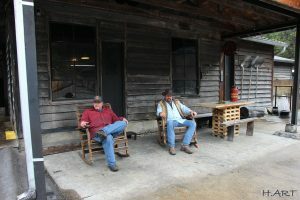 From the mellowing house the colorless and raw whiskey goes into American handcrafted white oak barrels that have been charred to perfection. 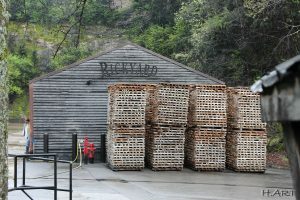 They char the barrels so the flavoring that is released into the whiskey over several years of storage becomes another ingredient to the final product. 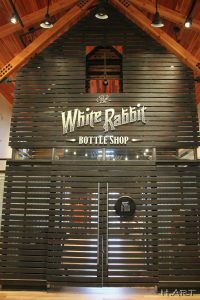 After learning all about the process on the tour we had the outstanding privilege of meeting the one and only Randy “Goose” Baxter in the Tasting House. 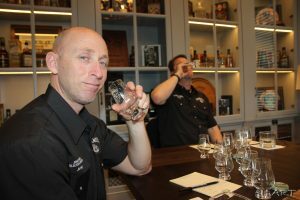 Goose is a master taster at the distillery and takes great pride in explaining how to properly taste a whiskey. 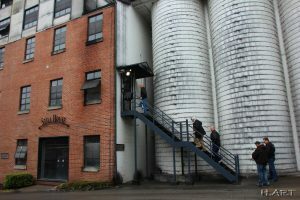 He started this mini course by giving us a brief history lesson on the Tasting House itself, and then went on to demonstrate how to ‘nose’ the whiskey first and foremost. 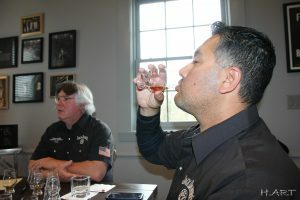 As we all stuck our noses in the sample glass, he encouraged us to try and pick up hints of the flavor before it even touches the tongue. He then continued instructing how to prepare the tongue and pallet before the actual ‘tasting’ could take place. 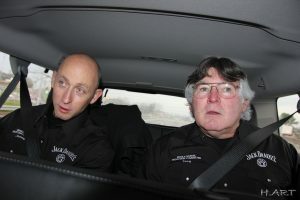 Goose directed us to take a small swig and swish the tiny amount of whiskey around the mouth, just enough to wash the cheeks and wet the pallet. He then instructed us all to take a small drink of water. He sipped his water, we sipped ours, patiently waiting to get on to the main event. He set his water glass down and it was time to taste. But it wasn’t! He then proceeded to tell us it was time to lick the salt from the back of our hands. Yes, lick our hands. According to Goose, this cleans the taste buds and prepares the tongue for a fresh swig. By this time, we were all so anxious to get the actual tasting started, we just couldn’t wait any longer to dive into the flavor samples. Goose saw the excitement in us and proceeded to reach for the first sample. Was it really finally time?! 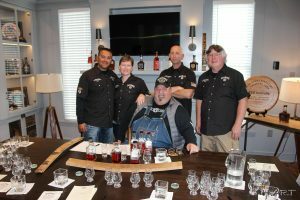 We all grabbed up the first of six sample glasses containing different barrel flavors and brought it right up to our mouths and waited for him to say go. 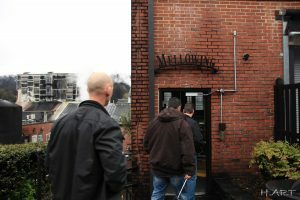 It was unreal how the flavors were so prevalent after such a process. 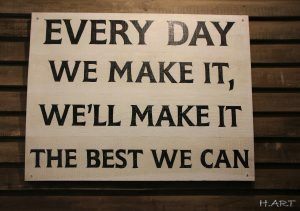 And this process was repeated for each and every sample. 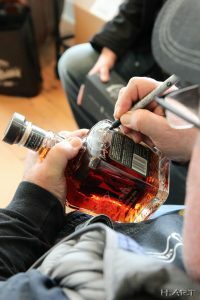 It was now very apparent why he took such great time and detail to show us the way of a master taster. Without Goose’s introduction to sampling, we would have never tasted the many different flavors in each glass. 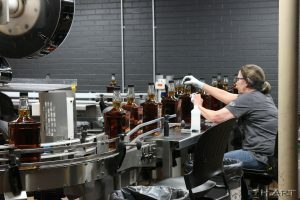 We wouldn’t have savored each and every swig picking up on the vanillas, the caramels, the different spices and of course the ever so stout flavor of the barrel wood. 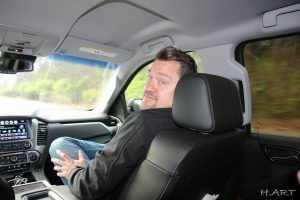 We surely wouldn’t have enjoyed the experience as much as we did without Goose. It was an absolute adventure sipping through just a mere six flavors. 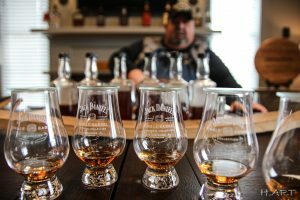 I can only imagine the fun the Master Tasters have when it’s time to select the next single barrel. 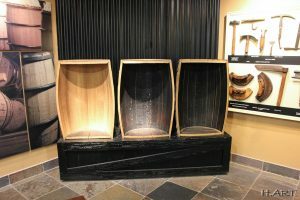 Our committee selected our three barrel choices for the October 1, fundraising project without much disagreement at all. 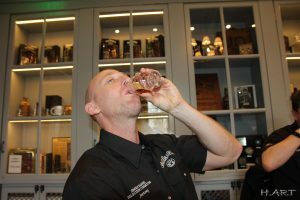 And with those choices, Jack Daniel’s created a flavor profile for the Las Vegas FOP Foundation. 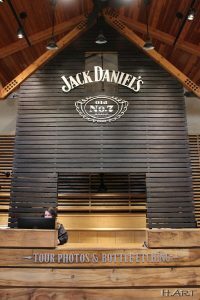 We were now officially partners with Jack Daniels. 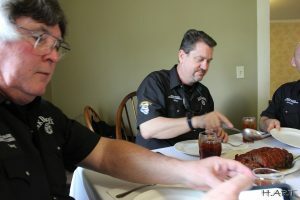 Once we were all good and tipsy from sipping whiskey for over an hour, they sent us over to Miss Mary Bobo’s for lunch. 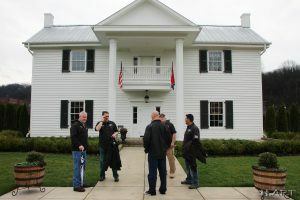 The one hundred and fifty year old house has been turned into a restaurant to cater to the Jack Daniel’s top clients and customers. 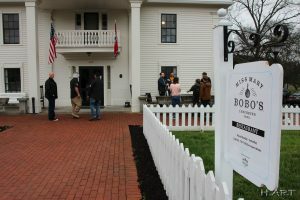 Our group was taken upstairs into what used to be an old bedroom and we were seated with another group that was also there to select a single barrel of whiskey for their organization. When the food came out, dish by dish, the whole table was in awe. It was as if we went back in time eating a homemade meal at Gramma’s house. 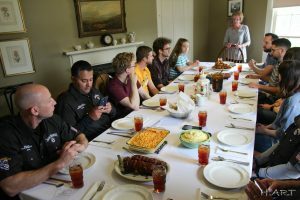 The hostess sat at the head of the table and told stories while the two groups ate the most deliciously made meatloaf, fried chicken, mashed potatoes, mac and cheese, whiskey baked sugar apples and tiny little pieces of divine square baked bread rolls, all served with……wait for it…….good old southern sweet tea! 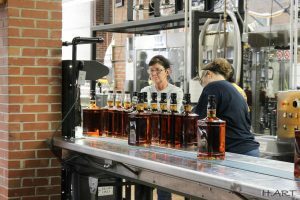 By the time we were done eating two or three servings we could feel the whiskey really starting to set into our blood stream. 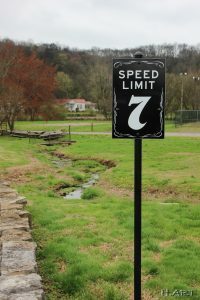 We carefully walked back to the limo paying great attention to the 7 mile per hour speed limit sign as if it pertained to us. 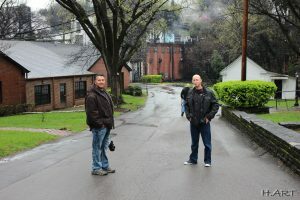 We headed back to the distillery to purchase some souvenirs and soak up a little more of the Jack Daniels atmosphere. Much to our surprise Mike announced that we would all be added to the Jack Daniel’s Tennessee Squire Association for attending a whiskey tasting session. While waiting to become official squires, we were once again treated to some good ol’ fashioned stories by Goose himself. I would try to describe this but I just couldn’t do the man any justice. He is someone you just absolutely have to meet face to face. 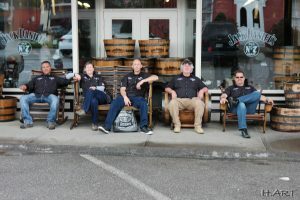 What a way to finish the most amazing day, listening to a legend and sinking into the most comfortable southern style couches in Tennessee……or at least that’s how they felt after being up for a full straight 34 hours at that point. Needless to say we all slept in our seats in the limo on the way back through the winding back roads of God’s gorgeous country to Nashville. The day still wasn’t over for us. Mike treated us to an amazing dinner as we all reminisced about the day that seemed, too good to be true.